Time for another reading list update. As 2012 is coming to a close, I have to say that the reading list this year has been a pretty good one. I am on track for fifteen or sixteen books read if I keep my pace up through December. It is hard to believe that I haven't posted one of these since April. Anyways, tons of books read. Most notable of them has been the first two books of the John Carter series. Yes, the same John Carter that Disney tried to make into a movie last summer. While the movie wasn't a smash hit at the box office. the first two books in the series are absolustely incredible. They are adventure pulp fiction at its best, and I was litterally on the edge of my seat while reading them. They have quickly gone to the top of my favorite books shelf. They are also public domain so if you have an e-reader, go download them for free. I also read books two and three of the Harry Potter series. I remember why those movies are so engaging. Nobody but J.K. Rowling can make boarding school sound so appealing. 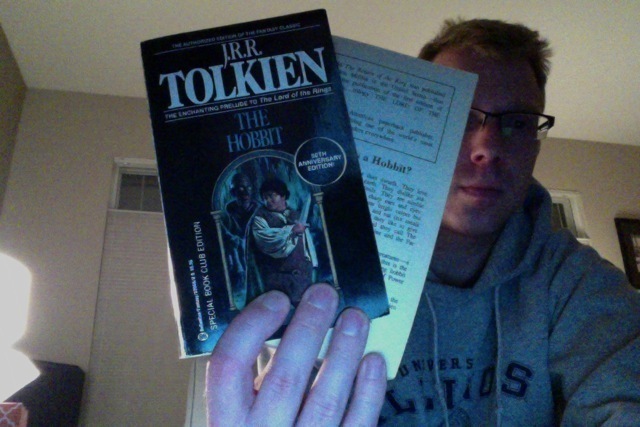 Finally I just started reading "The Hobbit" again last week. This year is the 75th anniversairy of the book and the movie is coming out in December. I think it apt to re-read the book, since I haven't read it since about fifth grade. To be honest I remember almost none of the story and I am amazed again at how good the book is. I am surprised how much the tone really comes across as a children's book though. The whole prose really gives a sort of Narnia vibe a little bit, much more so than the "Lord of the Rings". You can see above that my childhood copy is a bit of a wreck, so I am actually reading a copy I bought my wife several years ago.